The NEW Lava™ Esthetic features a unique, new shading formulation, pre-shaded with built-in colour gradient. The sintering step reveals the beauty of the high translucency, inherent fluorescence and natural aesthetics. All of these benefits, whilst remaining stronger than glass ceramics. 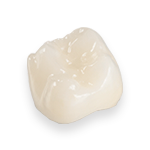 With 800 MPa1 strength, 3M™ Lava™ Esthetic Zirconia crowns offer higher strength than glass ceramic restorations – allowing for a reduced wall thickness of 0.8 mm2.